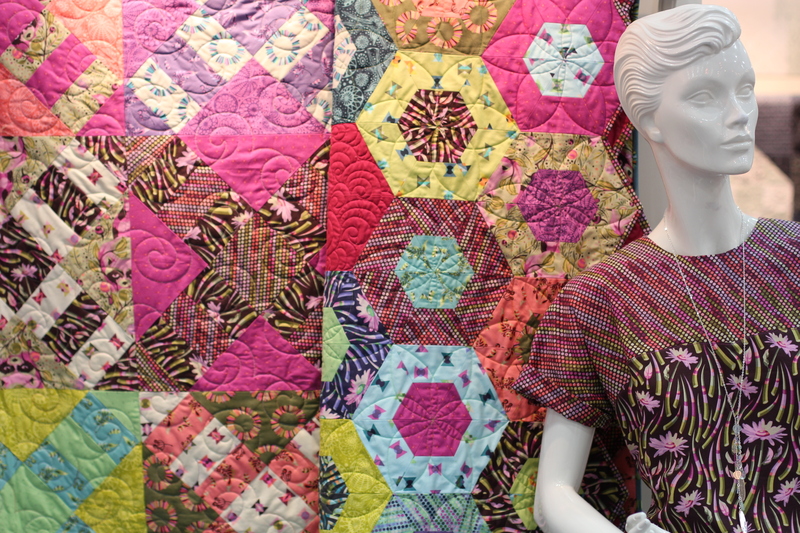 Day two of Quilt Market, I was standing in the aura of Tula Pink, Freespirit Fabrics designer, trying to take it all in when a woman interrupts my Tula Pink coma saying “Excuse me! I’m so sorry. Are you Tula Pink?” And so it begins. I’m later to find out that this character that confuses me with Tula is Mary Fons of Quilty Magazine. We giggle about the incident when a series of events finds me chatting with her after I’ve inadvertently crashed a quilting magazine industry party on the eighth floor of a hotel that is a few miles away from my hotel. This whole story is way better told in person. 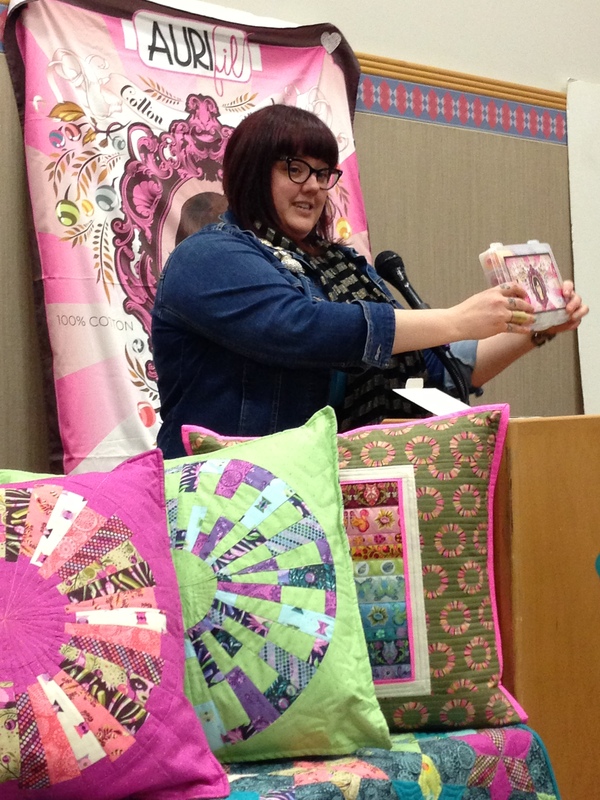 Tula Pink can’t be stopped. I am at times speechless just trying to take in the abundance of pattern, color, design, absurdity, beauty, and cohesion that is Tula Pink. 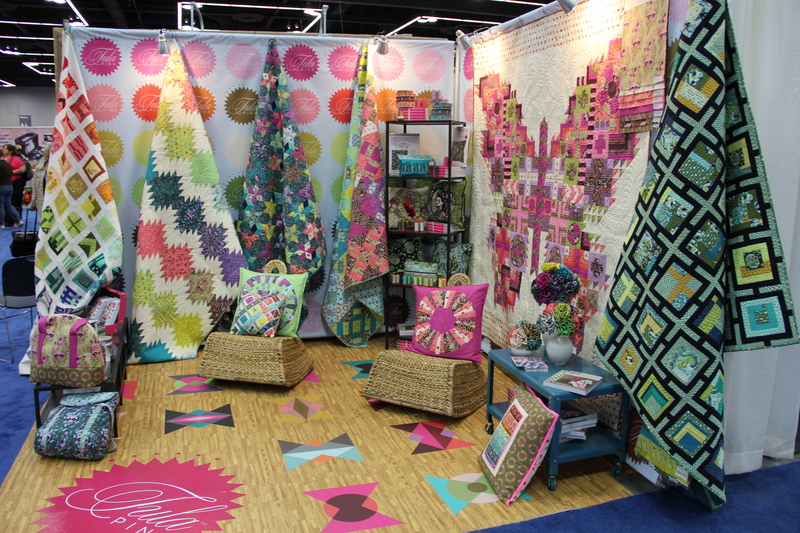 Take a closer look at her quilt market booth. A really great series of pillows. As quilts. As garments. As home decor. It all works. Holy. 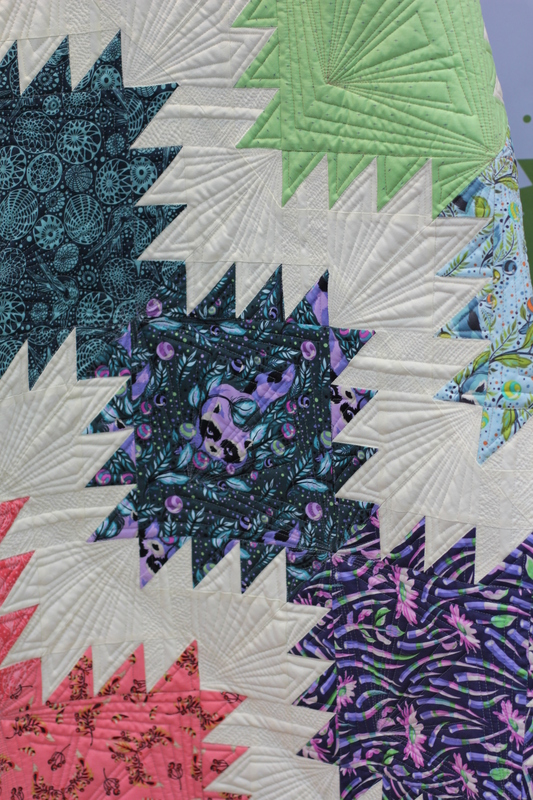 This butterfly quilt was designed by Tula Pink as a block of the month. You can bet your sweet bippy that we’re gonna do this at Crimson Tate. It’s absolutely stunning. 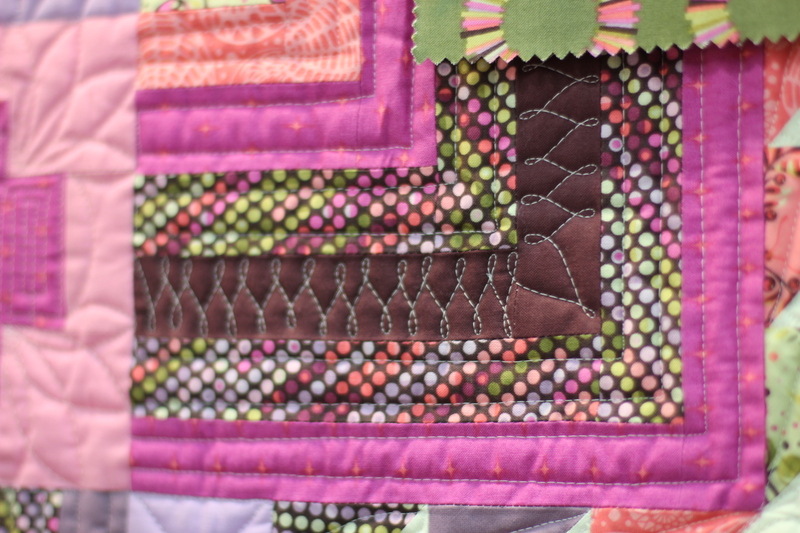 Here’s an up-close look at the quilting. So good. 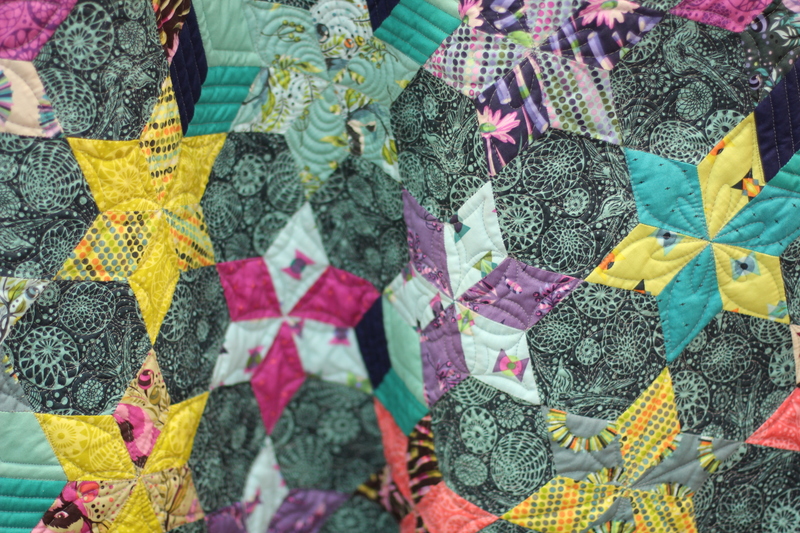 I’m angry that I don’t have a better photo of the entire quilt. I can still hear Tula’s voice as I’m franticaly trying to get a photo of it at her School House chat “Don’t worry. It’ll be in the booth. 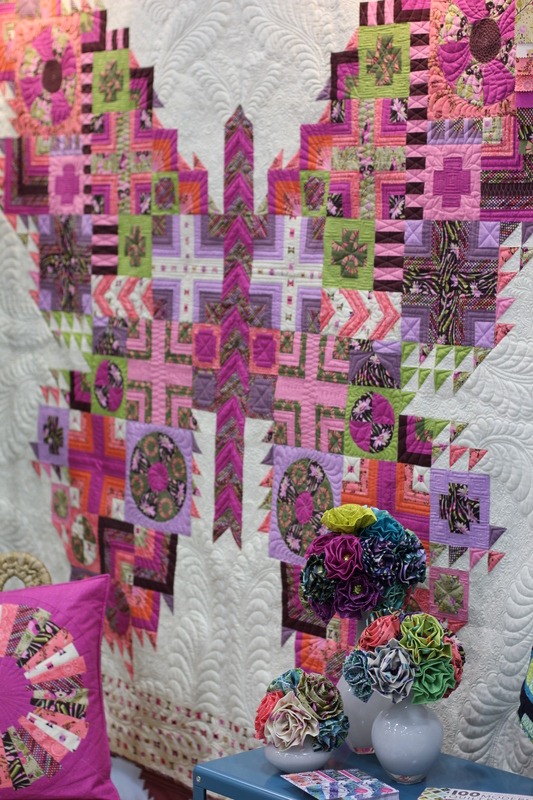 You can get a good photo of it later.” But in fact, I never saw the quilt outstretched again after that moment. I couldn’t get a full view of it. Ugh! But I did get a few close-ups so you can see why it’s so incredible. That Angela Waters. Whoa. And closer still. As my friend Lindsay of Ellesquare says “You drank the Kool-Aid.” And in fact I did. 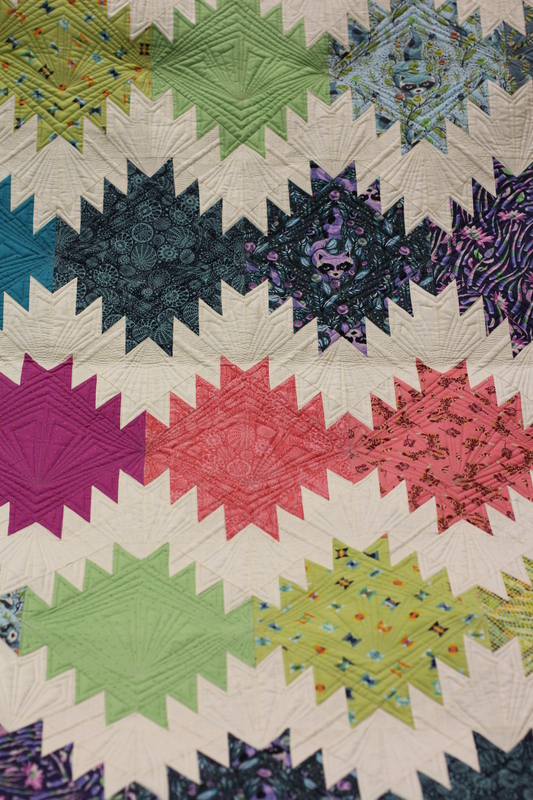 Coming to live at Crimson Tate in the next few months is not only Tula Pink’s entire line of quilting weight cottons from her collection, Acacia, but also her hand piecing kit that makes this quilt. 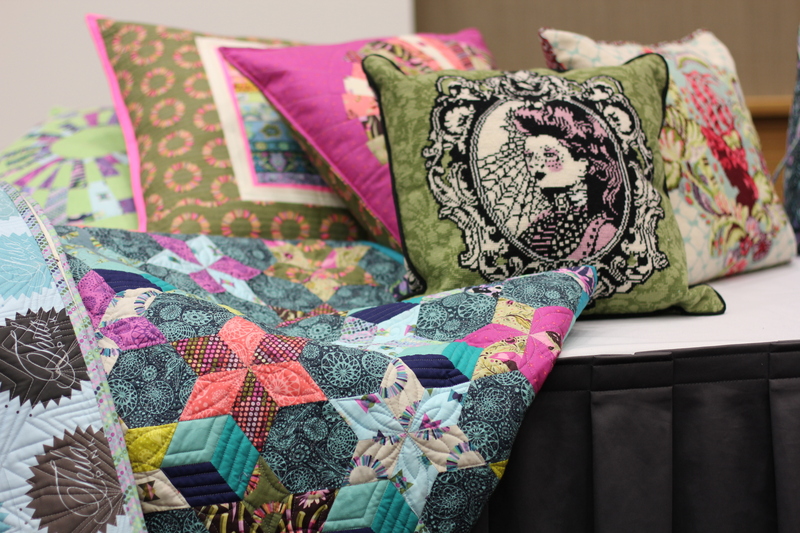 Seen again here along with needlework pillows, also coming to Crimson Tate. 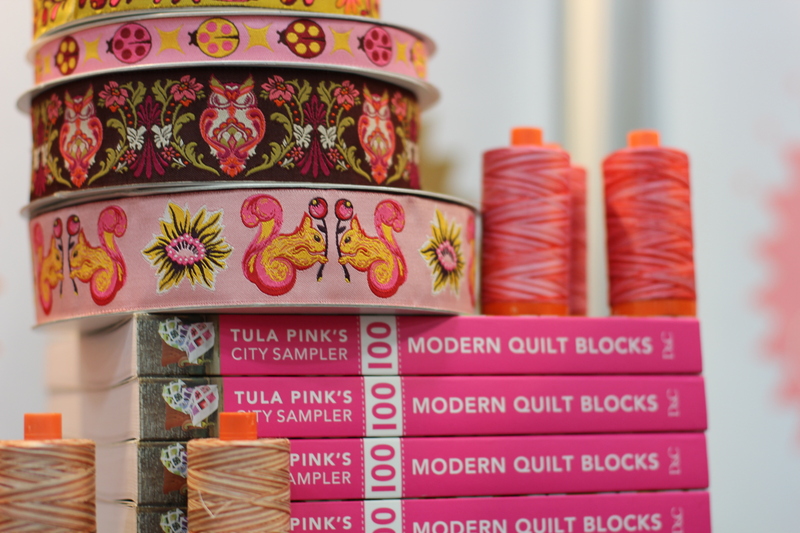 Boxes of Tula Pink Aurifil thread, both the large and small sizes along with her newest collection of ribbons for Renaissance Ribbons. I have a serious Kool-Aid mustache. I might have gone a little crazy. 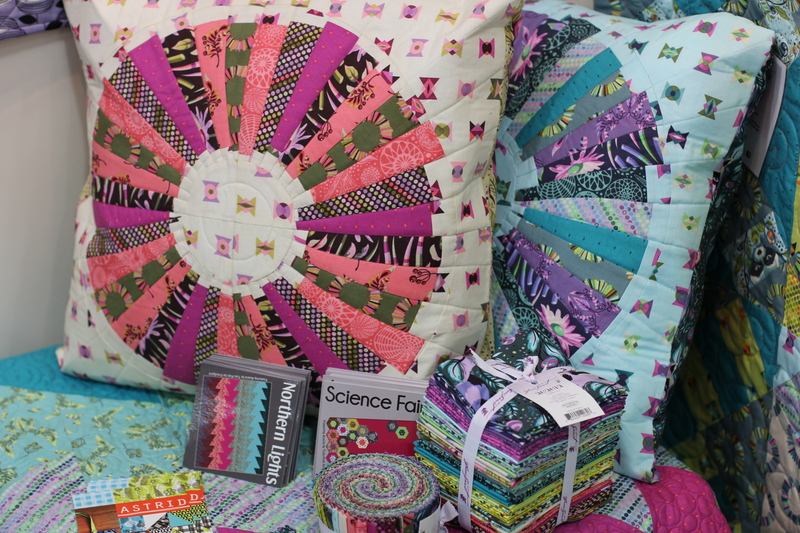 I leave you with a few other random bits that are interesting and all Tula Pink. Holy mother. Yeah! I can’t wait to see these at the store. 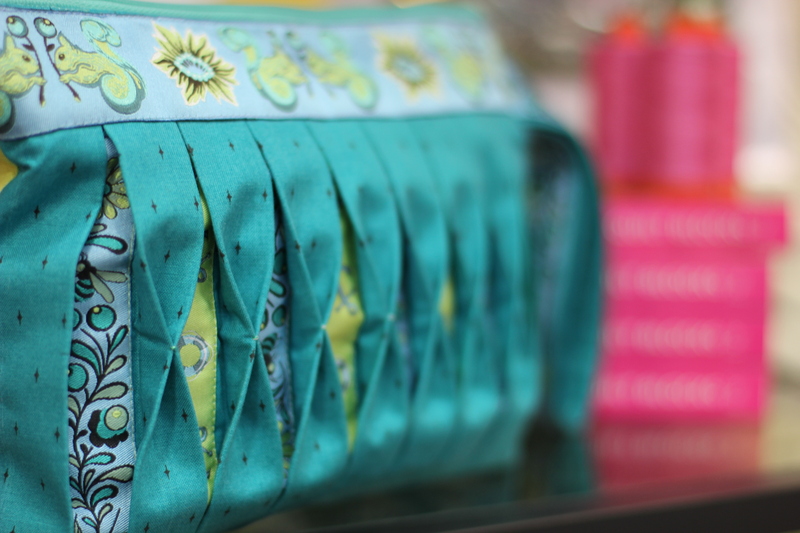 I’ve been wanting to try Aurifil thread and drooling over that butterfly quilt all over the internet. Ooh – I agree, that’s my favorite Tula quilt too!! Off I go to try and find out more about it! Oh MY! How do I love this post? Let me count the ways.. I was at Market for the first time ever, as a helper in my friend’s booth.. our booth was near Tula’s.. We were also at her schoolhouse for her book.. 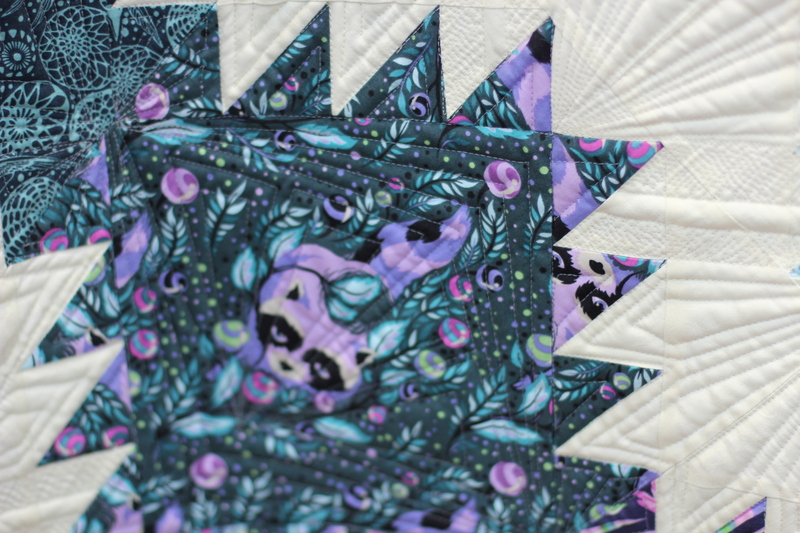 I came away with a total KoolAid mustache and a quilty crush on Tula myself! 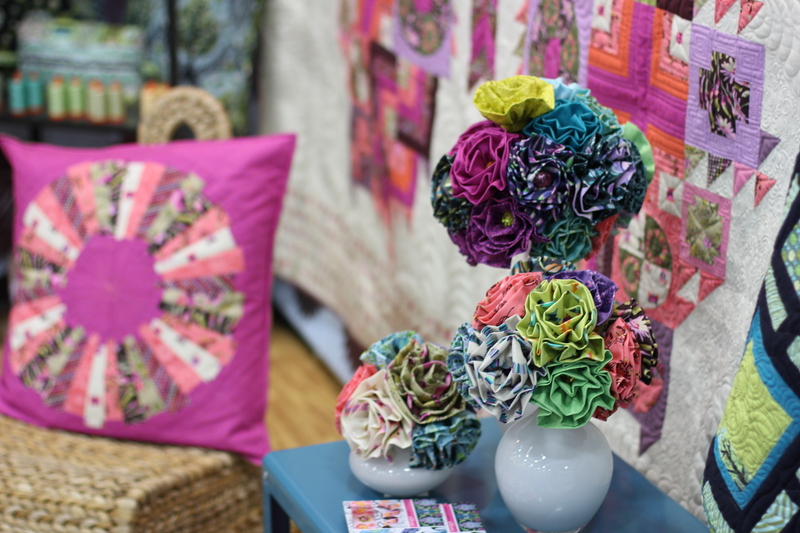 I could have stared at her booth, esp the Butterfly quilt all.day.long. All of them were stunning. You got the BEST pictures!! haha! it’s not drinking the kool aid, it’s “seeing the light”. 🙂 Thanks for the great photos for those of us who couldn’t be there! WOnderful! Thanks for showing all this goodness, crazy and somehow cohesive. Love that! 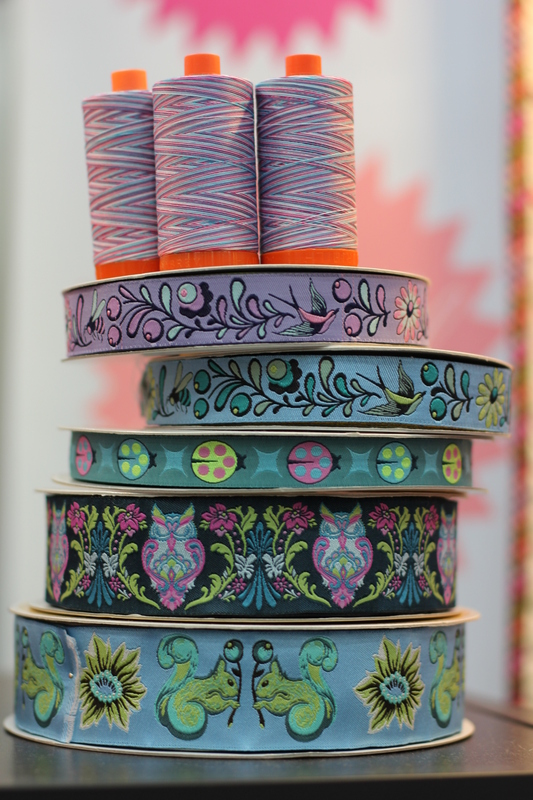 Where can I find the Tula Pink butterfly pattern? What a beautiful quilt! To my knowledge the pattern isn’t available yet. You betcha Crimson Tate will have it once it is. Stay tuned. 🙂 I agree with you. That quilt is incredible.